With new year resolutions upon us, this seems a good time to share my approach to managing emails, which I wrote down at the request of some of my colleagues. I do so recognizing that I have not completely cracked efficient working. I don’t always answer emails as quickly as I would like, and I do not always set my priorities well. Nonetheless, this system has helped me to stay largely on top of my inbox. This approach has worked for me partly because it has not required big changes in my working habits. It uses built-in functions of Microsoft Outlook, which is helpful because not everyone is allowed or wants to install special software. If this approach to managing emails sounds useful, here is a guide to setting it up in Microsoft Outlook. 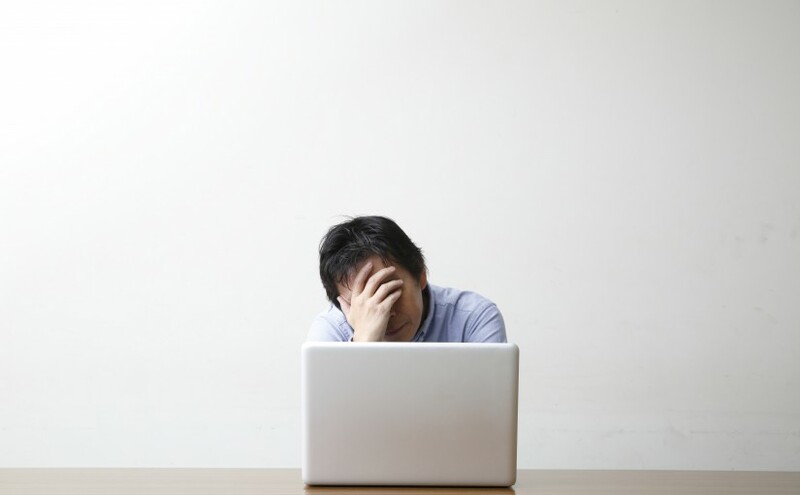 If those worries sound familiar to you, this approach to dealing with emails may help. There are some tasks which will take longer than five minutes, or which cannot be dealt with immediately because they require additional information or some action by someone else. These I tag with the date on which I want to deal with them – either today or on some future date. (I explain how to do so in the set up guide). That gets the email out of my inbox and ensures that I’ll be reminded of it again when I need to come back to it. 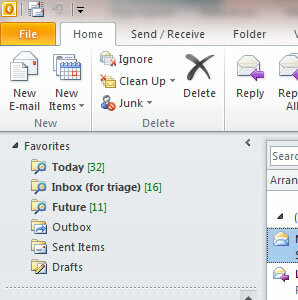 Once you have fully triaged your inbox, you will have a zero inbox. Everything will either be dealt with, deleted, delegated or deferred. You can then turn to your ‘Today’ inbox to deal with the things you need to do during the day. If you triage your inbox three or four times a day, your inbox should be close to zero most of the time. I have switched off Outlook’s pop-up notification and sound alert for incoming emails, so that new emails do not disturb me while I am working on something else. (Instructions for how to do this are included in the set-up guide). Instead of living in the inbox, I work mainly in my ‘Today’ folder which contains the emails which I have flagged for action today. I have set Outlook to open automatically into that folder. That folder contains emails which have arrived previously and which I have flagged for action today; others have arrived today and I have marked them as needing to be dealt with today. If there is something which I want to deal with later, but don’t yet know when, I kick the can down the road by queuing it up for a future Monday, often the first Monday of some future month. So each Monday, especially if it is the first Monday of the month, my Today folder is a bit more full than usual with emails for me to review. Some of them I kick down the road again to a future week or month; some of them I decide I am never going to tackle (or the moment has passed) so they get filed; some of them I can now deal with right away; and some of them I resolve to deal with this week and I put a particular date during the week to look at them. Into each of these I put emails which I am going to need in a particular situation (such as when travelling). Some people have a context folder for meetings with their boss, or with staff who report to them directly, so that they have a ready-made agenda for their next meeting. Within the @meetings context folder, I create a subfolder for each future meeting, and I drop into that subfolder any email that I am going to need for the meeting. Then when the meeting has happened, I move the sub-folder for that meeting from the @meetings context to my filed emails folder. If you still want to use the defer function described above, you should first put a copy of the email into the relevant context folder (by dragging it there while holding down the Control key) and then defer the original email in the usual way. There are several characteristics of this system which seem to be important. A trusted ‘to do’ list. I have tried lots of different systems, some more elaborate than others, and this particular approach has worked well for me. It will take about 15 minutes to set it up using this guide (but a bit longer to do your first triage!). If you use Gmail rather than Outlook, there is unfortunately no equivalent function to put dates on email messages. You could try Sanebox, or if you use an iPhone the new Mailbox email programme looks quite interesting. If you have suggestions for improving this system, please put them in the comments below. Boomerang for Gmail is also quite handy. It can return emails to the inbox at a certain point in the future (like a day or a week) which is useful if they can’t be dealt with immediately. When using gmail with Chrome or Firefox there is ActiveInbox (http://www.activeinboxhq.com/support/getting_started.php) It gives the possibilities of giving emails context, deadlines and “today”. As emails come in either Flag them for later, reply/forward them, or remove the Category colour. This takes them out of the Virtual Inbox. If there is a specific later to do the item on, then convert it into an event (see the Quick Steps area on the Home Tab to set this up for a click of a button). This is much too complicated. You can get all this behavior from Eatoni Triage (https://itunes.apple.com/us/app/eatoni-triage/id525578127?ls=1&mt=8) much more simply. You probably want to turn “Auto Archive” on in Settings so that mails which have been replied to or forwarded and labeled Archive when they come out of your Triage mbox. Owen – thanks for sharing your approach – it looks very promising. Despite being a knowledge management specialist, I experience many of the same frustrations you mention from not having a decent system to manage e-mail. I’m good at finding things later (a problem many people have with e-mail management), but not at avoiding stress at having lots of things in my e-mail and not knowing what to do next. I learned another tip last year that might be a useful addition. If like me you subscribe to a of newsletters and online communities etc. then you can end up getting an inbox full of things to read that might potentially be interesting (and that you might feel that you ought to know about to keep up to date). In reality I never find time to read all of these and I keep feeling I ought to somehow and that can be an additional source of stress. The tip I learned is to set aside a fixed time – possibly first thing or just after lunch to very lightly skim these – then pick out anything you want to tweet or forward to colleagues and do that immediately (using hootsuite to space tweets out over the day for example) – then file anything that is “interesting” but too long to read or for which you don’t feel immediately motivated to tackle and file it under “read later”. The trick is you probably never will go back to read this later – but it will be off your mind and out of your inbox – but if for some reason it becomes useful/interesting enough to read you will be able to go back and find it. Thanks Owen. Like Ian I get a lot of newsletter type emails, as well as mass sent work emails (notifications that servers are going to be down at midnight etc). For both types of emails I use auto-filters that instantly move the emails into their own folders without any action required from me. I then check these folders at reasonable intervals (maybe daily for work related mass emails; a couple of times a week for newsletters). This reduces my inbox clutter and, theoretically at least, distractions. How about moving (and deleting from your inbox) emails that are send in c.c. to you? Have you used Eatoni Triage app for iOS? It is designed to do exactly what you are talking about. Previous Previous post: How committed is Europe to development really?